To view the Point Parameters form, choose “Point Calculation Parameters” from the Setup menu. To enable automatic point calculations make sure “Activate Scorecard” is marked. 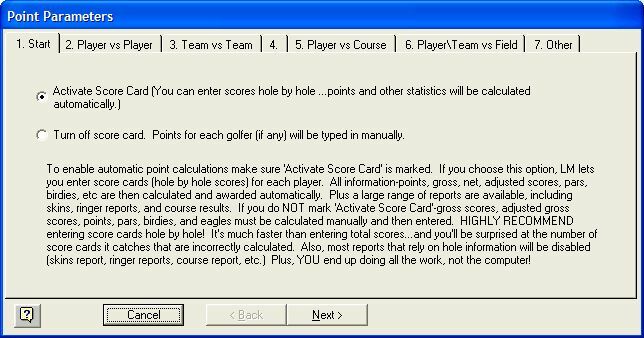 If you choose to use point calculations, League Manager lets you enter scorecards (hole-by-hole scores) for each player. All information—points, gross, net, adjusted scores, pars, birdies, and eagles are then calculated and awarded automatically. Plus a large range of reports are available, including skins, ringer reports, and course results. If you turn off the scorecard—gross scores, adjusted gross scores, points, pars, birdies, and eagles must be calculated manually and then entered. I HIGHLY RECOMMEND entering scorecards hole-by-hole! It’s much faster than entering total scores...and you’ll be surprised at the number of scorecards it catches that are incorrectly calculated. Also, most reports that rely on hole information will be disabled (skins report, ringer reports, course report, etc.) Plus, YOU end up doing all the work, not the computer!